From time-to-time my wonderful mother-in-law brings me a new addition for the kitchen. This time out it was ghost pepper salt. I am a fan. Why am I endorsing a gimmick salt? You see, while I could put hot sauce on my tomato slice, along with some good extra virgin olive oil, this salt doesn't run off when I slice into it. It keeps the heat where it belongs. I'm not much of a plate-licker. 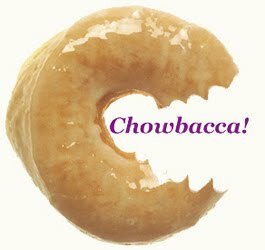 It's searingly good on smoked albacore too. Also, she's brought me a smoked salt and a smoked pepper in the past and I've found them useful in my cooking. I've used them in St. Louis sauces and spice rubs. I have a hickory salt that I break out from time-to-time. It's salt. It doesn't go bad like most seasonings in the pantry, and that's a good thing. 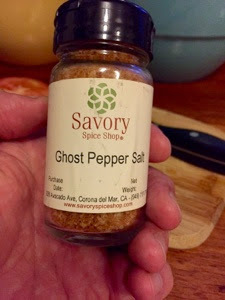 Next, I'm going to find some other uses for the ghost pepper salt. I also have some Black Pepper Mint Chocolate Sugar to check out. In the mean time, I feel a spice rub coming on. 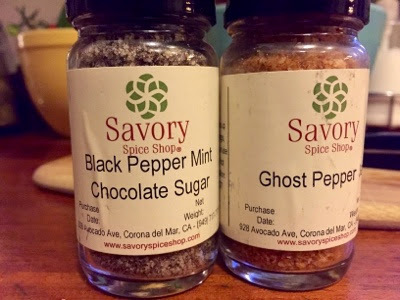 Savory spice shop has some brick and mortar locations but you can also shop with them online.